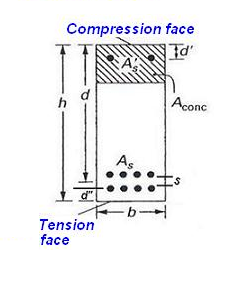 Overhanging beams are the beams which have some portion unsupported on either one or both sides. 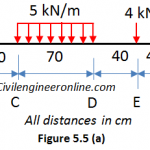 These beams may be determinate or indeterminate depending on the number of supports and the types of supports. 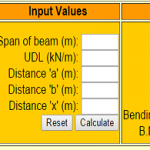 An Excellent online calculator for overhanging beam for calculating the values of support reactions, shear force and bending moment exist at the following link. 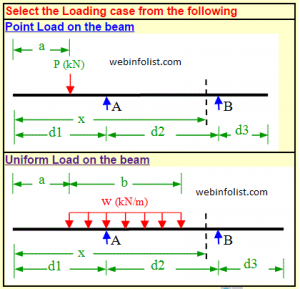 This calculator can be used for the loading cases of concentrated load and uniform load acting at any point of the beam. In case of a combined loading case of concentrated and uniform load you can use principle of superposition. 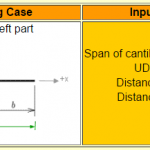 You can also use this calculator to find the ordinates of influence line diagram for solving the problems of moving loads. 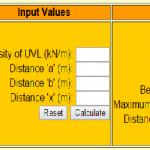 The calculator is available Free on the following link.